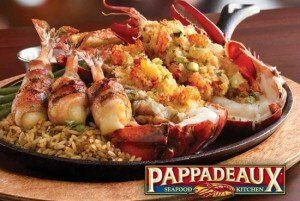 Restaurant Meal Prices | Pappadeuax Seafood Kitchen! 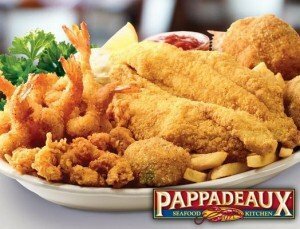 Pappadeaux Seafood Kitchen is well known for its seafood and deservedly so. This family owned business has been around for a while, and they have continued to whip up delicious meals, but besides the main dishes, there are plenty of appetizers here as well as salads and gumbos. Before you order their lobsters and shrimp it’s a good idea to sample their appetizers too, especially the Crispy Fried Alligator ($13), available in medium and large helpings. In true Pappadeaux tradition, the servings are generous, with two portions good enough for four people. For those who haven’t eaten this type of appetizer before, the taste is somewhat like a cross between a fish and chicken, and it’s tender and juicy. Besides the Fried Alligator they also serve some very good salads including Greek salad (small, $10, medium $13, large $16), and though this isn’t traditional it’s very good and well prepared as well. In addition you should check out the Spinach Dip and the Crabmeat ($12.95), and the Stuffed Shrimp ($19.95). Pappadeaux also serves up a number of other fried seafood treats including the Shrimp Etouffee ($21), which is one of the best New Orleans Specialities they have. Their restaurant also serves a number of oyster appetizers including Gulf Coast oysters, which for $8.95 you can get half a dozen, and for $13.95 you can have a dozen. The Oysters Baton Rogue costs $13.95. But definitely the highlight here are the seafood, and their lobster and crab selection is pretty good, with the Live Maine Lobster costing $29.95 and the Grilled Caribbean Lobster Tail (10-12oz) around $29.95. In addition to these there are several sides, Chef Selections, naked fish and Pappadeaux Classics including the Costa Rican Tilapia Alexander (7-oz) which costs $19.95 and the Atlantic Salmon Yvette (11-oz) for $24.95. They also serve “Louisiana” Shrimp Gumbo (Cup) for $7.95, the Andouille Sausage & Seafood gumbo (Cup) also for $7.95 and from the grill, the Jumbo Shrimp Brochette for $23. However, their menu isn’t limited to just seafood as they also offer a lot of chicken and steak including Angus Beef Rib-Eye (16-oz), Filet Mignon (8-oz) and the Filet Mignon & Grilled Caribbean Lobster Tail for $49. And yes, they have a lot of sides on offer too. 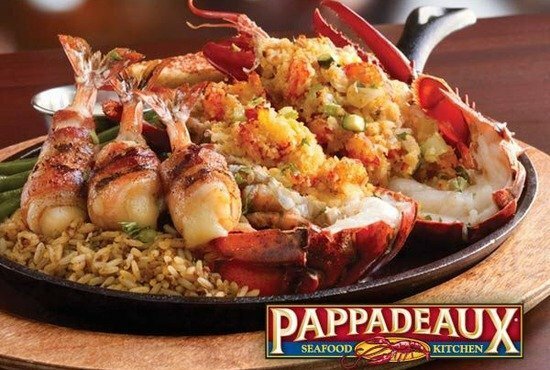 Pappadeaux has several locations, but they do share many things in common such as the heavy Cajun influence which becomes apparent the moment you sit down to eat. Just like with the other Pappas Restaurants the serving portions are very generous, and the lobsters are cracked prior to serving so you can reach the meat easily. Besides the seafood, they also serve vegetables and rice, both of which complement the lobsters rather well. Taken everything into consideration, Pappadeaux Seafood Kitchen is a great place to dine in, with sumptuous food and very good service. Also, the restaurant is large and spacious with outdoor location available in most locations. In addition there’s a bar area with several drinks available.